In May of 2016, I expressed my personal excitement for the release of SAS 360 Discover to the SAS platform, and the subject of predictive marketing analytics. Since then, I have worked with brands across industries like sports, non-profits, and financial services to learn about valuable use cases. 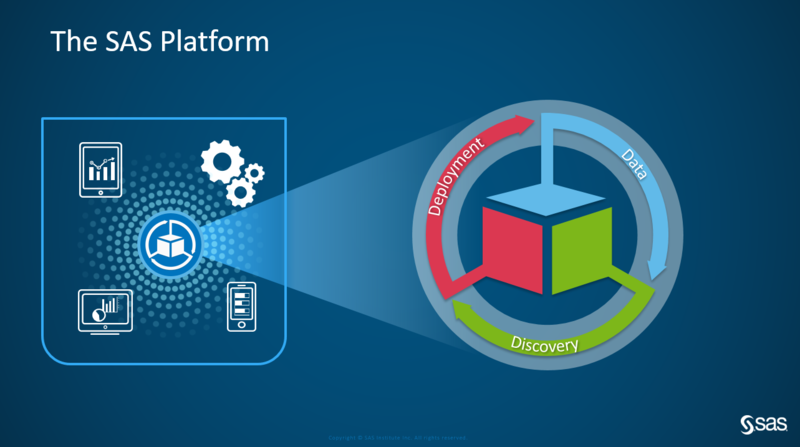 Before diving in, here’s a primer on SAS 360 Discover. Digital analytics is a crowded space of mega-vendor incumbents and niche technology players. For an impartial view, check out the latest Gartner’s Magic Quadrant on digital marketing analytics here. Are you surprised to see the participant with the highest ability to execute? The technology feeds SAS Platform the recipe to tackle the challenges of digital intelligence. Here’s a breakdown of the underpinnings. 22 aggregated tables of all digital interactions flattened for customer-level data stitching, predictive analytics, machine learning, and data science. 10 aggregated tables for typical digital analytic reporting, but also custom visualization and reports that one might desire to perform in their favorite software (SAS or something else). Here’s my view on digital analytic technologies that claim to solve every imaginable problem. When you want to build a robust, machine learning model to solve a marketing challenge, your vendor informs you can extract the hit or session-level data into your own data analysis environment. They claim to liberate you to explore the depths of the data science world, but there’s an underlying gap that will rear its ugly head. 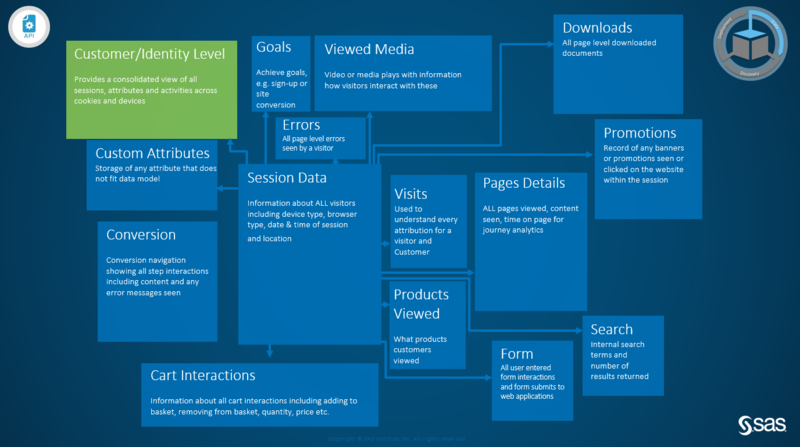 You want visitor and customer journeys, not hits or sessions. Analytics depend on input data views to maximize its potential. And turning that data into value requires analytics. Nearly every type of business has seen an explosion in the amount of data that it must store, process and understand. Data is everywhere, just waiting to be analyzed. It’s generated by the actions of people and devices. This constant flow of data could put a new level of intelligence within our reach. But at the same time, there is increasing pressure to shorten the time to value, and serious inhibitors stand in our way. 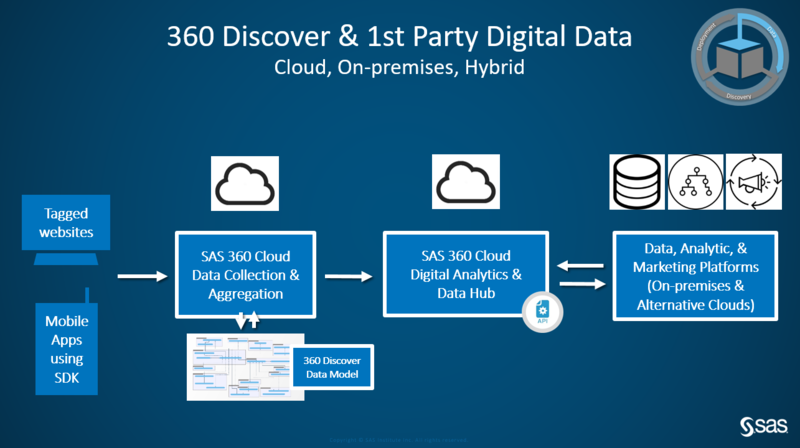 The SAS 360 Discover data model is an accelerator that turns your first-party digital data into value through analytics. Because whether you are a business user, analyst, statistician, coder, or data scientist, I would bet you’ve never been in a meeting with your executive leader to discuss the hardships of data preparation. Value is the result of analytics impacting your marketing strategies (see Figure 3). 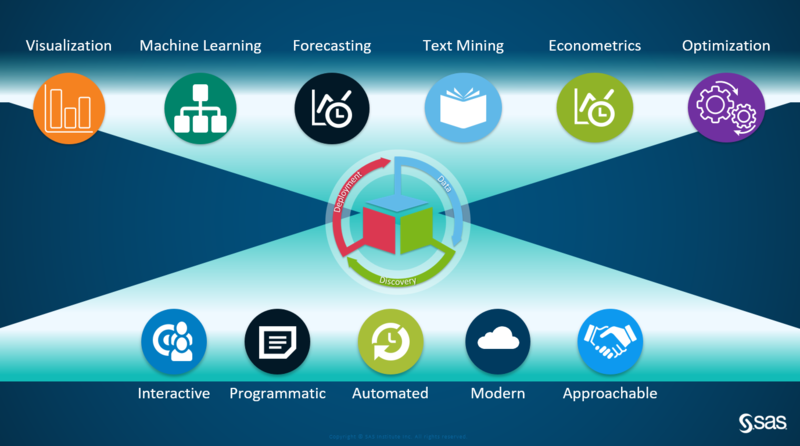 Referencing the Gartner study mentioned earlier, the SAS platform’s ability to deliver across all of these flavors of digital intelligence comes into focus (see Figure 4). But there is one area of the study I want to drill into. Direct access to customer data at the enterprise level. in campaign selection and execution. That last benefit is where SAS 360 Discover dovetails into the mix (see Figure 5). 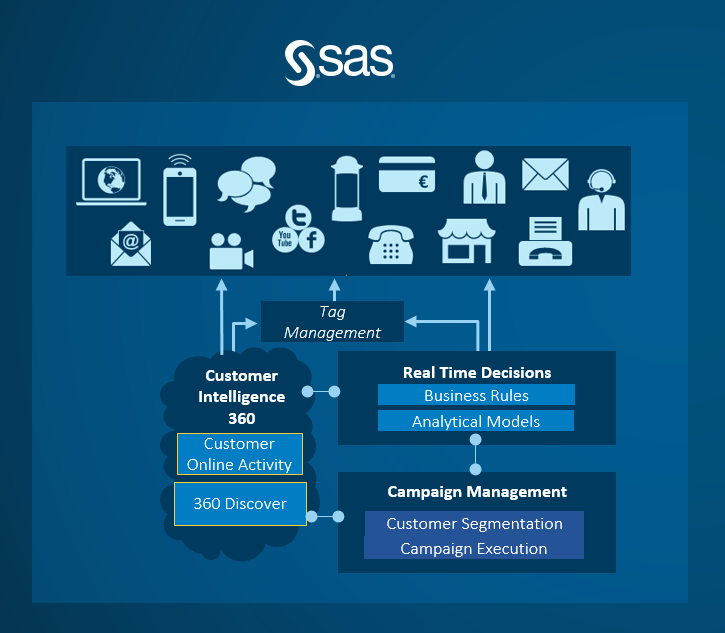 By providing digital customer journey mappings into the information map of SAS Marketing Automation, it becomes just as easy to segment qualified audiences for campaigns using CRM attributes like age, geography, or revenue, as well as digital journey attributes such as site engagement, micro-goals achieved, or number of interactions online in the last 30 days. The value props cannot be understated: usability, embedded data management, unmatched analytics, and integration of one common, open data model for creating custom processes and selecting online and offline data attributes for cross-channel campaign management. SAS’ vision is to transform a world of data into a world of intelligence. To this end, data complexity, adoption of machine learning and siloed channels should not be a barrier in 2018.